Another figure in the saga of the lost naming rights issues. Double Clutch, huh? Not Lance “Clutch” Steinberg or even Cpl. Clutch? Suppose that would have to wait for the later convention version. When I first saw the name Double Clutch, I thought it might be a new character, or even possibly a clone. Just kidding. I find a lot to like with this mold, as I wrote about in my coverage of a later second reuse as a more vintage styled Recondo. It has a sort of Devil’s Due vibe, with the cap in place of a helmet. 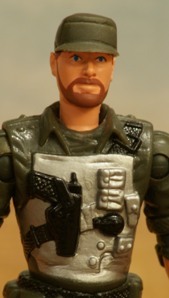 I’ve always thought the original Clutch figure was really interesting for departing from the other early Joes’ look with its shoulder holster and unique shirt design. This figure echoes some of that pretty well. The new sculpt figures sometimes threw in a little extra articulation, and this figure is a good example. He’s equipped with swivel wrists and a swivel at the top of his boots. The wrist swivel is a great addition, and helps out with weapons posing. The boot swivel is nice, but not quite the improvement of an ankle joint. Nevertheless, being able to swivel the feet does add a bit of extra stability when posing a figure in a kneeling position. Clutch looks like a mechanic to me. I suppose it’s the gloves, rolled up sleeves and cap. He really looks like he should be driving or in the motor pool working on a vehicle. I’ve even seen some customs use this figure as a base for a Cobra mechanic as seen in the early scenes of Pythona’s attack in the animated movie. Thankfully, Clutch is a dark green in this version, even though he came with a green vehicle called the Desert Coyote. He makes for a good modern interpretation of a classic. I always liked this guy but never found him at retail in SD. I think he works so much better as Clutch than he ever did as Recondo (who I have because he came with an Iron Grenadier more than any particular affinity to the original Recondo). Those are some beefy forearms, definately looks like a mechanic!! I think I would use this version of Clutch as the modern version more than the POC version that came with the POC VAMP. I also have the Recondo he shares the mold with, but there could’ve been a different design used for everyone’s favorite Joe jungle trooper. I was glad to see this guy turn up back in the day. He’s an okay figure for its era. Still waiting for a proper comic version of my namesake with his trademark black facial stubble. This was a great updated! I have an issue with most of the figures from that era. The forearms were always too big, and the rivets at the shoulders seem huge.